You asked for them! They are here! Our vintage whiskey barrels are here! If your winery wedding dream has a wine barrel cake stand or a couple of barrels put together for a table, we can make that dream happen. Perfect for cocktail tables or a bar. Metals straps have a lovely rusty patina. Introducing our new Palmer Garden Chairs! These beauties predate the 1950s and exude a rich and warm color. They look awesome with our classic farm tables or our whitewashed French Farm Tables! We found the Palmers in Lafayette, Indiana where they were once used for weddings and other events. We restored and hand-finished each one to bring them back to their original beauty. 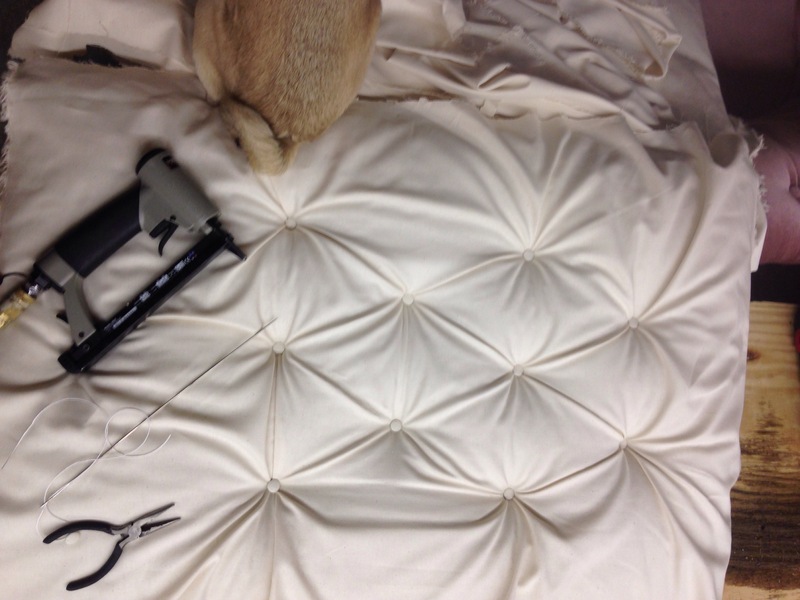 To make the tufted panels for the front of bars, we cut 2 sheets of plywood to size, applied upholstery foam and batting with spray adhesive and set out to tuft the cream duckcloth fabric that we used. Excuse my cute pug in this pic! 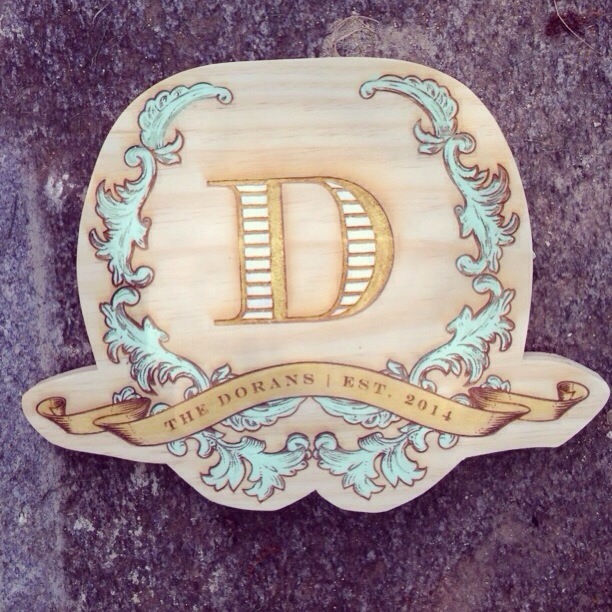 Lauryn wanted the couple’s custom crest in the center of the bar, so we laser engraved with the logo from the couple’s invitation. I really like how they turned out. We painted the crests in the couple’s colors because it complimented the gray paint on the bar. Excuse the crappy pic that I snapped with my iPhone, but here is the finished product! I think the bar turned out awesome and looked perfect in this space at Goodstone Inn—and our antique crystal chandeliers compliment the bar beautifully. We really had so much fun working with Lauryn to make these bars a reality.